Pride and Prejudice, I think, is my favorite Jane Austin movie. Its so hard to chose! Sense & Sensibility and Pride & Prejudice are my number ones. Emma a close 2nd. 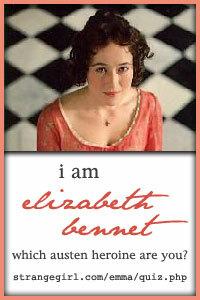 If I had to be another character besides Lizzie, I would want to be Elenore Dashwood. She is just fabulous and I still tear up every time I see her cry when she realizes that Mr. Ferris has not married the ugly little girl with which he has been secretly engaged to these many years. My sister and I watched the 6 hour P&P 4 times in one week a few years ago. Such a great movie, great characters, great acting. Who can resist Mr. Darcy's character? You just hate him and love him all in the same breath. Oh, I love Jane Austin! I just thought I should post a quick note so that people would have something new to read if and when they visit my blog. Nothing more discouraging than to go to a blog for a month and not see anything new. I am in Washington right a this moment. I am in Spokane visiting my parents and tomorrow Jana, the kids and I drive back to Seattle. I have to do a few things on our house that we are selling in Maple Valley before I am able to go back to Colorado. Its a little bitter sweet. I am having to stay a bit longer than I anticipated which is "yay" for me to spend more time with family and friends, but also sad for me because I will have to be away from my husband longer. The last time we were away for this long was 2 months after we got married and He went to Africa for 2 weeks. Talk about the stupidest decision that we ever made. Newlyweds should never be away from each other for that long. "Almighty God, we pause to reflect on Your character as we seek wisdom for such a time as this. In the unprecedented events we're facing, You remain absolutely sovereign.Our times are in Your hands. Therefore, our dependence on You, is total, not partial . . . our need for Your forgiveness is constant. . . our gratitude for Your grace is profound. . . our love for You is deep. We ask that You guard and guide our President and all who serve the people of these United States. May uncompromising integrity mark their lives. We also ask that You unite us as truly "one nation, under God." May genuine humility return to our ranks. And may that blend of integrity and humilityheal our land. In our Lord's name we pray, Amen". I thought it was a great prayer to pray over our nation today. I hope that all of you are taking time to thank the Lord for his blessings on us and the wonderful United States that we get to live in. I'm a year closer to 30. At least I'm not Lisa who will be 30 in 10 days - LOL! My darling husband woke up early, went and got me Starbucks and then took me to " The Original Pancake House", which serves the best breakfast in the world. I had the crepe's with fresh strawberries. Yum! Then tonight we went and had sushi with our friends Paul and Lori Trani. Curt bought my favorite cake from Whole Foods. Its called the Chantilly Berry Cake and oh my goodness! If you get a chance, go to Whole Foods in Bellevue and try it. They sell it in individual pieces. The picture of the cake is at a funny angle because we had eaten the other half :) But it is a beautiful cake. So I had a really nice day :) Bill and Jenn sang me the most energetic version of the Red Robin happy birthday song. It was invigorating! All my family and Curts family called to wish me a happy birthday. I am blessed.